determined by some genetic code? Welcome . . . you're a candidate in The Program. 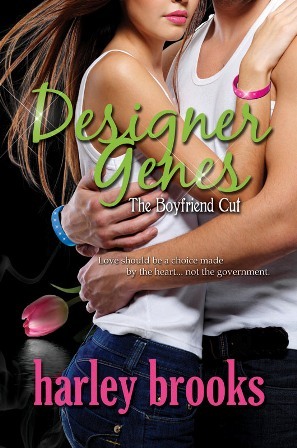 Born with the genetic markers the government seeks, an unassuming seventeen-year-old girl is dropped in the middle of a covert cloning program where her future is secretly decided. Marli Davis wants out of the government's clutches until . . . she meets her destiny. Over six feet of lean muscle, lips that should be registered as lethal weapons and the perfect link to Marli's genetic code, Jordan Mason's only strategy is to fulfill his government contract, not fall in love. His heart, however, changes the game plan. But when Jordan's rebel twin brother tempts Marli with an escape from her manipulated fate by living life inside his arms, Marli must decide if a life without love . . . or Jordan, is really free. Love should be a choice made by the heart . . . not the government. This morning I boarded a private jet bound for Florida while my friends headed to the mall to shop for dresses for Senior Ball, or the beach to color their winter-white bodies. They were free. No pre-planned destiny or life altering decisions made on their behalf. Unlike me. Today I interviewed for my assigned mate. Candidate 2255: Jordan Mason. Confident, boldly honest, and the most incredible looking boy I'd ever seen. Me? Candidate 5846: Marli Davis. Seventeen and scared to death. I pretended it could never happen—me—"chosen." I believed I could live life unscathed . . . unnoticed . . . normal. A fantasy . . . definitely a lie. Now my nightmare.